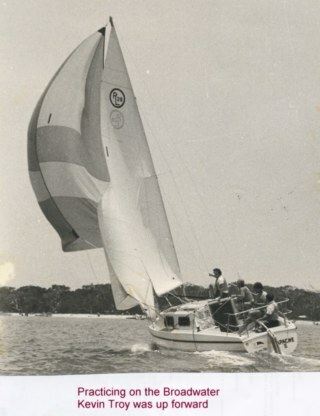 Christmas 1977 was only a few weeks away and we were keen to race further afield. Apache 11 had been performing well in local events; a new mast head spinnaker and big light weight head sail had been added to our sail wardrobe and these sails had greatly improved our performance. The South Australian Tripoli's on St Vincent's Gulf was to be our first big test, almost 2000 km away. It would be a good trial trailing a boat that big and provide good competition for us. 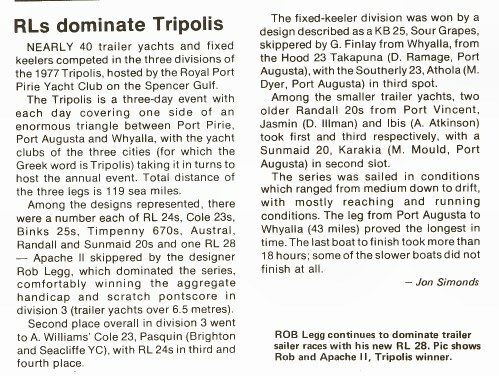 We were later told that when our entry was received at Port Pirie, bets had been placed that we would never make it with a boat that size on a trailer. It was the 24th of December and our first challenge was the steep climb over Cunninghams gap. It would be the steepest climb by far of the trip. No problem, our Ford V8 station wagon made it easily in second gear. Our plan had been to stay with friends at Boggabilla over night, but to leave the boat at the local police station as the road in to their place, was in bad condition. Next morning before sunrise we connected up the trailer at the police station and driving along I felt that the car lacked power. A little further up the road I could see a strange glow at the back of the boat in the rear vision mirror, sure enough I had forgotten to disengage the trailer parking brake. The brakes on the trailer were very efficient and the boat on the back made no difference to our stopping distance. With a 60 kg draw bar weight the boat was hardly noticeable on behind. Late that night found us in Port Pirie. We had averaged 80 kph on the road over the trip. This was much better than expected. Boxing day morning, and a fleet of forty boats at the Port Pirie start for the first leg to Port Augusta. Local identity Doug Martin and his son Neil were sailing with us - nothing like some expert local knowledge! 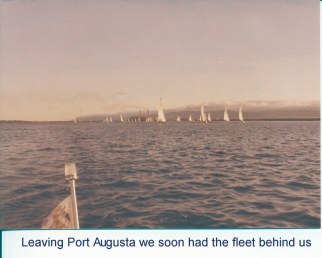 A good start in clear wind to leeward, and we were soon in the lead, which we held to the finish at Port Augusta. A strange phenomenon occurs on the gulf at this time of year. Dodge tides are predicted, but they can not say for sure if the tide will come in and stay in, or run out and stay out for the twenty four hours, and strangely the rise and fall is greater at the top of the gulf, not the bottom. 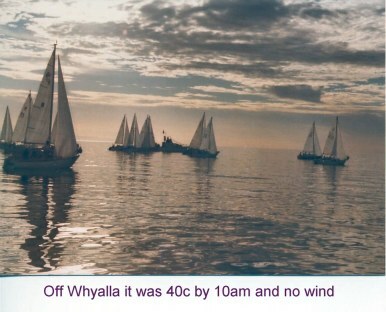 The early start next morning at Port Augusta saw Apache 11 soon have the rest of the fleet tucked in behind her, and revelling in the light down-wind conditions reached Whyalla well ahead. The third morning at Whyalla was very hot and still. By the 10am start time, the temperature was 40C. We sat on the start line with our feet in buckets of water, searching the horizon for breeze. A southerly change had been predicted, but nothing was in sight. The lightest zephyr appeared from the east and a decision had to be made to go onto port or starboard tack. We headed south to try and find the predicted change, and the rest of the fleet took the opposite tack towards a cloud bank in the north. To cut a long story short there was wind under the cloud, but not to the south. Apparently on the gulf in this sort of weather the locals usually go chasing clouds and find wind. When the wind did set in, it came from the north. Weather forecasters the world over seem to get it wrong, but the locals are hard to beat on their home ground. It took us the rest of the race to catch the fleet, but our crews' knowledge of their local channel gave us an advantage and in the end we came in second, but that was OK as the winner of that leg was a RL24. On the last day I had earned the displeasure of the crew after boasting that we had the luxury of a shower. I had only part filled the forward water tank to save weight, and on the hottest day we ran out. Well you can't have everything in this life! The time came to get the boat back on the trailer, and of course it would be dead low tide on a muddy ramp. I backed the trailer down the ramp and it seemed that the whole crowd in the club house moved out on to the balcony, as much as to say "this will be worth watching". I said to June, "You winch the boat on and smile while you do it, and I will just guide it, that will fix them!" The boat went on easily and there was a cheer as we drove up the ramp.